If there is one thing we do well at Games2win India Pvt Ltd it is to challenge the status quo and defy convention! For our game casual mobile game “International Fashion Stylist” we asked ourselves if the ‘pretty stylish’ icon we had for the game conveyed the message that the game was about dressing up and choosing between mind-boggling varieties of clothes and accessories! (1500+ items!). We changed the icon and made it about the goodies inside the game vs created false ‘imagery’. To do this, we had to use a cluttered approach. We went ahead with it, without a second thought. As a Company, our karma is to generate the max numbers of free, viral, organic downloads of our games – NOT to ‘look good’ and surely NOT to win silly awards! The results speak for themselves. 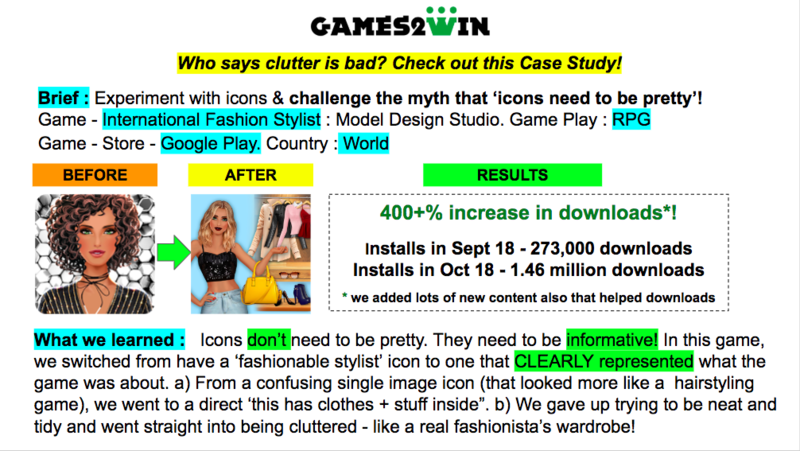 We went from 273k downloads in Sept 19 t0 1.46 million downloads in October (Important Caveat – we also added lots more content into the game but the icon change played a pivotal role). Lesson learned – Challenge what the world says. Most of the time, it’s not really true!